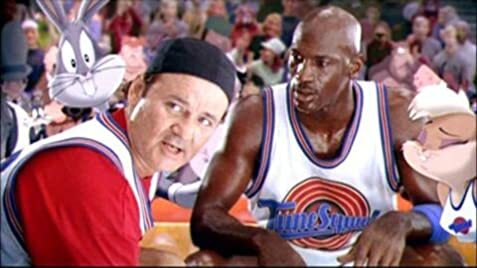 In a desperate attempt to win a basketball match and earn their freedom, the Looney Tunes seek the aid of retired basketball champion, Michael Jordan. Which sport makes for the best movies? A paranormal expert and his daughter bunk in an abandoned house populated by three mischievous ghosts and one friendly one. The Little family adopt a charming young mouse named Stuart, but the family cat wants rid of him. When a boy learns that a beloved killer whale is to be killed by the aquarium owners, the boy risks everything to free the whale. An absent-minded professor discovers "flubber," a rubber-like super-bouncy substance. An evil high-fashion designer plots to steal Dalmatian puppies in order to make an extravagant fur coat, but instead creates an extravagant mess. James Jordan: Michael? What are you doin', son? It's after midnight. Michael Jordan at 10: I couldn't sleep, Paps. James Jordan: Well, neither can we, with all that noise you're making. C'mon, let's go inside. Michael Jordan at 10: Just one more shot? James Jordan: All right, just one. Courtesy of ZTT Records Limited/Warner Music UK Limited/Warner Bros.
Q: What movies feature games of wacky basketball? Q: Who were the couple at the basketball game next to the monsters? The Movie of My Childhood, and Still Today. Arguably my favorite movie of All Time, Space Jam was an instant classic from the first time i laid eyes on it as an Infant. Even though you may not entirely understand everything that is going on in the movie at a Young age, it is still pretty easy to get into the movie. Not spoiling anything in this movie in this Review..but i will say that even today it is an entertaining Movie that i will pick up here and there and still have a fun time watching. Such a simple storyline, yet enjoyable down the years. Michael Jordan, Looney Tunes, and your classic cartoon villains trying to take over. This is just one of the Movies that, well...got me interested in movies. And that's why i gave it a 10. Not necessarily just because it was my favorite....it had a lot of elements that i simply enjoy. And on top of everything, its a movie about Basketball, which is something i'm passionate about. In all honesty, when it comes right down to it. I can only say one thing. If you haven't seen this movie yet, or even haven't watched it in a while. Go pick it up. You'll find yourself having a very entertaining time. Guaranteed. 9 of 11 people found this review helpful. Was this review helpful to you?